and ultimately bring more happiness and understanding to the world. 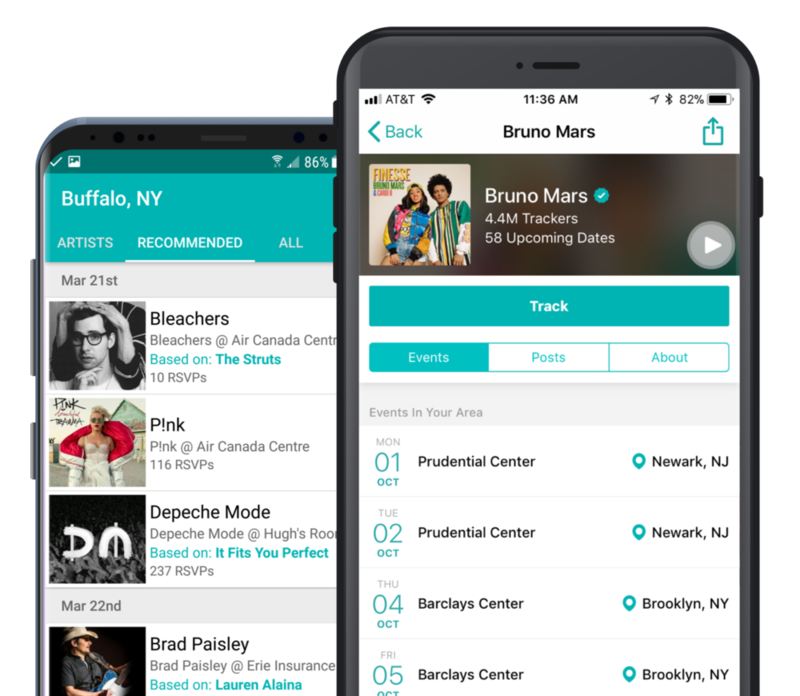 Bandsintown Concerts provides a personalized way for music fans to track their favorite artists so they never miss a live show and to discover new touring artists, based on their music preferences and location. ￼￼￼￼￼￼￼THE INDUSTRY STANDARD FOR ONLINE TOUR PROMOTION AND SOCIAL MEDIA MARKETING. Bandsintown Manager, the #1 tour promotion app in the world, gives artists an incredible platform to connect with their fans. Promote tour dates, communicate directly with fans, and increase fan social engagement. Syncs tour data to Bandsintown.com, Facebook, Twitter, YouTube, Google Search, Tumblr, WordPress, Squarespace, Beatport and more! Bandsintown Amplified is a multi-screen advertising platform that connects brands with a passionate community of fans and artists through an exclusive network of 50+ publishers. PROMOTE YOUR EVENT TO CONCERT-GOERS. leverage our innovative ad solutions to reach concert-goers who are interested in your lineup. Advanced targeting by affinity, behavior and location. Ideal for festival and tour line ups, pre-sale and on sale announcements, VIP experiences. Industry-leading presale / onsale email campaigns open rates and click through rates.